Collage has come a long way, baby. Once upon a time it involved cutting with scissors and pasting with glue. In today's digital age, it's all become a whole lot easier. The hardest bit is sorting which photos to use! 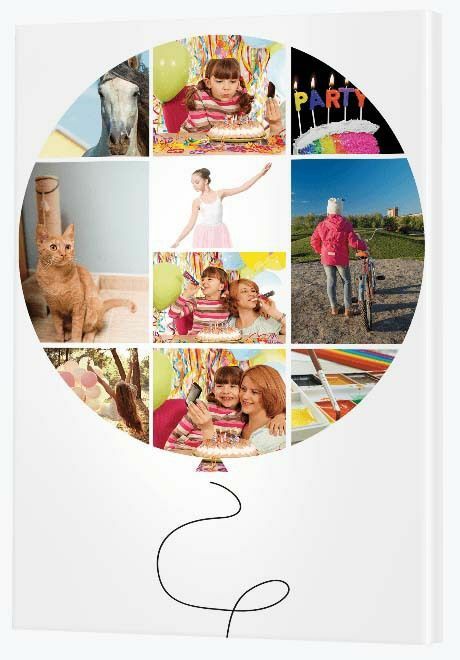 With over 40 different collage templates in our collection, the number of photo collage ideas is endless. To get your creative juices flowing, we've included a dozen suggestions, but there's more where they came from. The cute as a button baby romper collage template is begging to be transformed into a work of canvas art. Make your little one the primary subject in all five panels, using black and white photos on the outside with a cute, colorful photo in the middle. The wonderful thing about this modish design is you can upload the full color photos and use the CanvasApp to remove the color, frame by frame. Simply select 'Create A Canvas' at the top right of the screen, select 'Canvas' as your material, click on 'collages' then - under shape - select 'Modish' then 'Modish 11'. Upload your photos, place each of them onto the collage then click 'Choose Style' to select your wrap color. Once you've done that you can move onto 'Effects'. It is here that you can turn your color photos into greyscale. Click on each photo, frame by frame, and select 'Grey' each time. You'll see the color change in the preview. Make sure the center photo you've chosen is the most colorful of them all. It's meant to leap out and brighten the collage without taking away from the wonder of the black and white photos. Gather together a few of your daughter's favorite things and create a fun collage that will inspire her to fly. And then I don’t feel so bad." Sound Of Music's 'My Favorite Things' is perfect inspiration for this gorgeous balloon print. 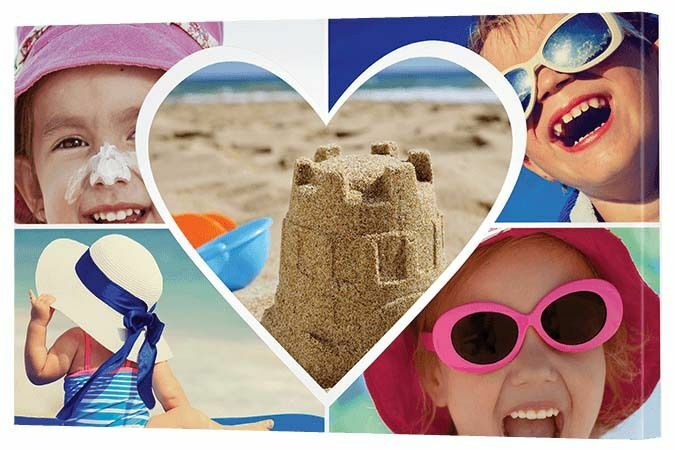 Collect a variety of photos (and you've taken a lot of them!) and upload them onto this balloon collage. Include her favorite activities (sport, dance, art), her favorite people (friends and family), her favorite animals (pets and wildlife) and her favorite things in nature (seashells, flowers). 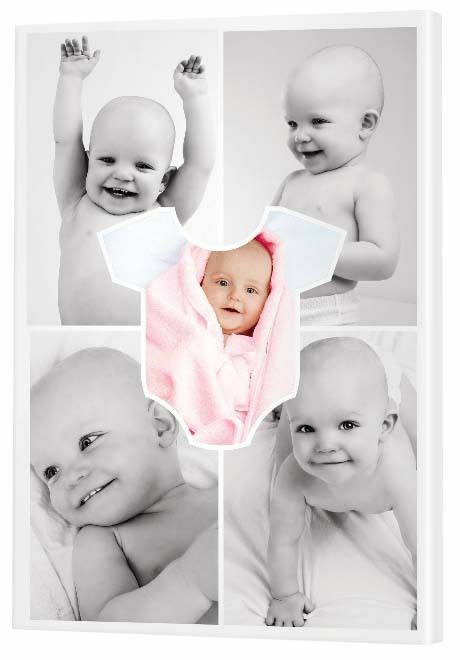 With 10 frames to fill, she will scream with delight when she sees this personalized print, styled just for her. Alternatively, let her drive the creation of the canvas. 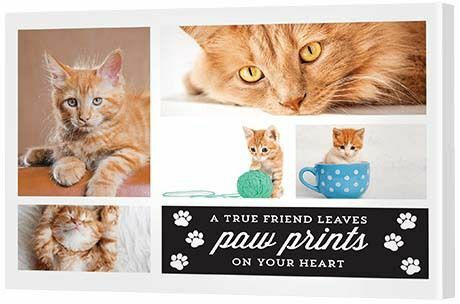 Visit Canvas Factory's Silhouette collage collection so she can OK the use of the balloon collage or choose a completely different style - heart, butterfly, paw print. Watch as she plays around with the 'wrap style' and 'effects' tools like she's a seasoned pro. Here she can change the background color of the canvas and change photos from full color to black and white or sepia tones. Don't let those treasured travel memories sit in a Facebook album, destined to get lost among the Saturday night selfies. 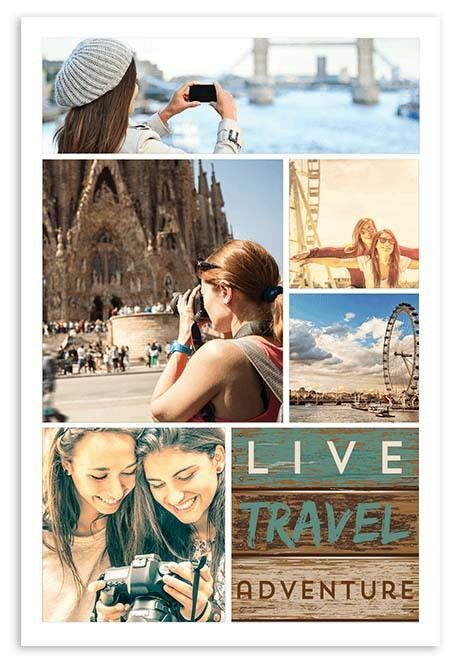 This cool, contemporary 'Live Travel Adventure' themed collage is the perfect way to print the top five photos from your most recent or most favorite trip away. Having this print hanging on a wall at home will not only bring back wonderful memories, but it will inspire you to save for the next destination on your bucket list. That's the idea, anyway! Place your new travel print in a hallway or living area and it will double as a conversation starter. No-one ever tires of talking about travel! And there's no need to stop at just one. These themed collages are the same price as a single canvas print, so you can create a brilliant wall series of all your travel experiences. Haven't yet been bitten by the bug? This collage also makes an amazing gift. Simply stalk your friend or family member's Facebook or Instagram pages and create a collage for them. The most awesome thing about arranging this gift is that, unlike traveling, you don't even have to leave the comfort of your home. Our CanvasApp design tool is just a mouse click away. This simple two-panel traditional collage is perfect for highlighting the magical moments of everyday life. The best things in life need not be complex which is why this easy to produce collage is an ideal match for capturing the marvelous bond between father and son. You don't need to arrange a professional photo shoot to find images that will enchant. Just look to everyday life. 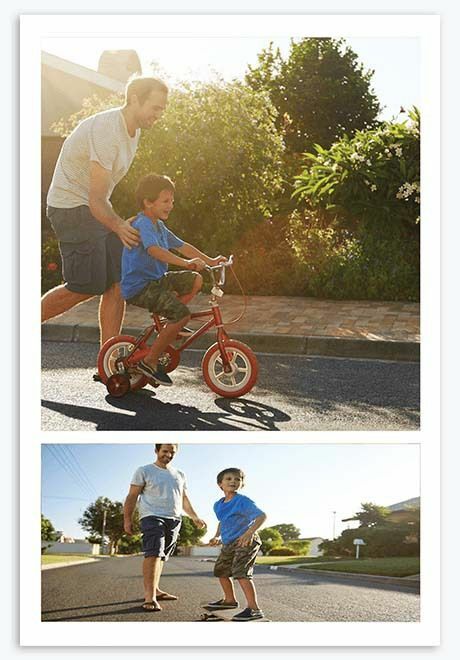 Here we've caught on canvas Dad teaching his son how to ride a bike and a skateboard. They're the moments that are fundamental to our futures, not sitting in a studio with fake smiles and a silly hat. "When you teach your son, you teach your son’s son"
Collage doesn't mean tacky. It doesn't mean girly. But - when done well - it does have impact. Who is this collage for? Father or son? Take your pick. There is no better way to honor the generations than to create a collage full of photos of the three (or four) family members who hold that acclaim. This collage is a gift that Grandmas the whole world over will love, three generations of girls and women enjoying each other's company - and all related. Get Dad to take the photos while yourself (Mom), your daughter and your mother (Grandma) get together for plenty of laughs. Any excuse for a tea party, right? New love is exciting, romantic and fanciful - definitely worth capturing on a fresh, fashionable glass collage. You'll thank each other for capturing those early days when love was pure bliss and anything seemed possible. Love will endure, but the intensity of romance will likely ebb and flow. Perhaps this print will help you reflect on those early stages and keep the spark alive. This themed 'Live. Laugh. 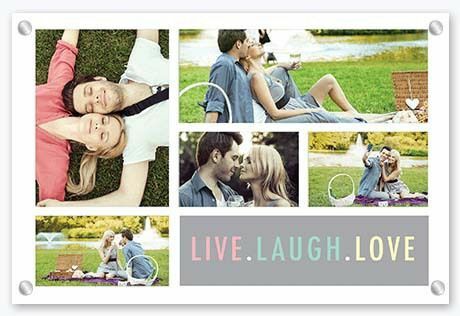 Love' collage is ideal for the ultimate romantic - a Valentine's Day Gift perhaps or simply a 'no reason' gift to win your partner's heart. If you've been blessed with double the trouble, you will love the benefit of having 10 photo frames to fill. 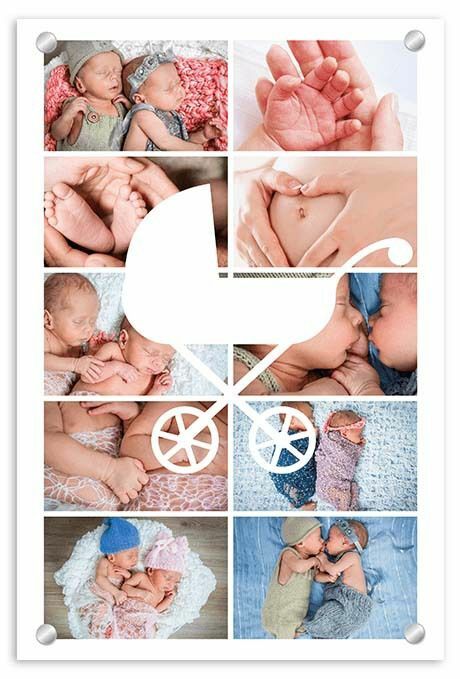 This Baby Carriage collage from our Silhouette collection is 100% all about baby and, if you've just had two of them (or even three), the more room to move the better. Take this collage to the next level and print it on acrylic glass. Our quality glass prints provide a clean, crisp feel with a shine that adds instant style. This adorable print is ideal for the Mom who, when ready, has to return to work - a great way to dress up a desk. Dad may prefer something less 'cutesy' for his office - the Modish collage collection may be more his thing. Grandma will join baby and go 'ga ga' if she too receives one of these. It makes a wonderful babysitting thank you. When you're building your baby carriage print, be sure to experiment with 'wrap style' and 'effects'. Here, we've featured the frame and baby carriage in white, but you can change the color to anything you like. One trick we recommend is to use the eye dropper tool in the CanvasApp to capture a dominant color from the photos in the canvas and use that as the background. That said, if you're not comfortable with experimenting with colors, just leave it white - it will look great as is! 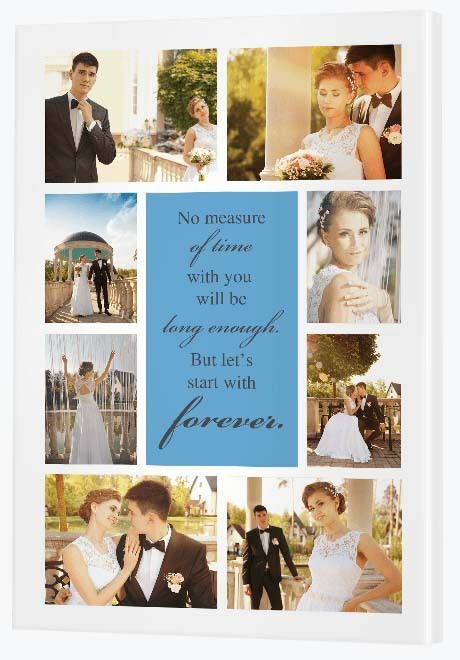 Bring a wedding collage alive with a love poem that will speak to both of you for years to come. This popular nine-panel traditional collage design is a customer favorite for so many reasons. It not only provides plenty of frames for photos, but the frames are shaped either landscape or portrait, keeping photo cropping to a minimum. It also features simple stylings - no themes, shapes or silhouettes. It's essentially, excuse the pun, a blank canvas. And the wonderful thing about a blank canvas is that you can include anything you want on it, including a love poem. To create your own personalized poem, you can use Photoshop, Gimp or Canva. If you're not a graphic designer, we recommend Canva as it essentially does all the hard work for you. All you have to do is choose the background color, the font style, the font size and the font color. From there you download 'PDF: To Print' and save it onto your computer - somewhere you'll easily find it again! If you have trouble converting a PDF to JPEG to upload to Canvas Factory's CanvasApp, simply email the image to [email protected] and we'll finish your collage off for you. Amazing adventures deserve to be remembered at every possible moment, particularly when sitting behind your desk at work! Say goodbye to boredom and hello to adventure with an extreme sports collage to mount on your office wall - either at home, at work or both. 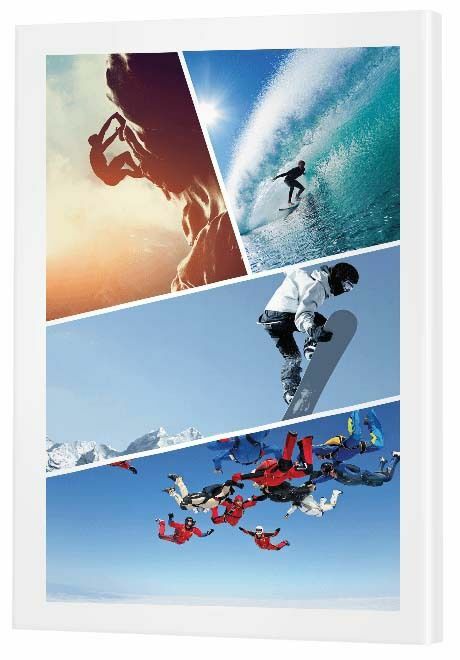 Gather up your best surfing, skiing, skydiving or abseiling photos and place them onto a stylish collage from our Modish collection. While you're at it, you might even like to do the same for a mate. It makes for a great gift and you know he'd be totally stoked! The Modish designs are great for sports photography as the angles and lines of the frames mirror the artistic stylings of the photos themselves. 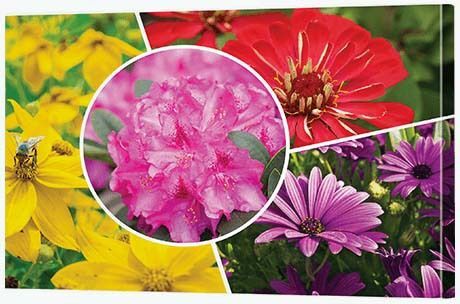 The largest size this collage can be printed onto canvas is 32” x 48” (80 x 120cm), so if you want something larger you may need to reconsider your options. If you have a favourite photo that epitomises the extreme, consider printing it large. How does 36” x 54” (90 x 135cm) sound? Alternatively, you might like to print your collage or single print onto glass or metal. Now that's what we call extreme! To brighten your interior, bring a piece of the outside world inside. A big bunch of flowers, anyone? There's no need to fill a vase when you can fill a collage with photos of beautiful flowers from your own garden. Put away the clippers and pick up the mouse. This modish collage design is so easy to create, you'll certainly agree that growing the flowers is the hard part! This truly claw-some collage will be sure to paw-lease the cat lover in your life. If that's you, all the better. This pet themed collage is touching to use 'in memoriam' or to honor the life of one of your oldest friends. From cute kitten to wise(ish) elderly cat, there are five frames to tell his or her life story. It's pawsitively purrrfect, don't you think? 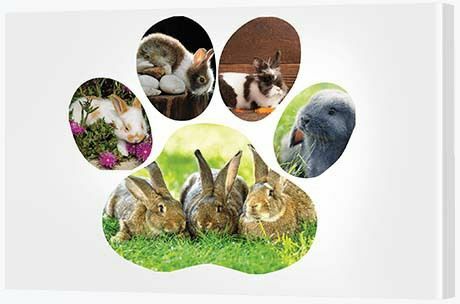 A paw collage from our Silhouette range is a wonderful way to honor any member of your furry family. When considering this design, the only pet prerequisite is that it comes with paws. Including fish, birds, snakes or lizards in a paw print would be pretty odd. Let's hear it for the furry mammals! The trick with this print is too zoom into the photos on some of the frames to bring our the detail of your furry friend. Use the zoom tool in the CanvasApp to achieve this effect.